Few statues have had such a rocky history. When celebrated condottiere Bartolomeo Colleoni died it was discovered that, in gratitude for the Republic’s goodness towards him, he would leave it the princely sum of 100,000 ducats on the condition that it erect an equestrian monument to him ‘super platea San Marco’. After all, Colleoni’s predecessor, the condottiere ‘Honey Cat’ Gattamelata, had got a fine one by Donatello in Padua(paid for by the Republic). Greedy for the money, but gagging at the thought of erecting a statue in the sacred Piazza San Marco to anybody on this planet, much less a mercenary warlord, the Senate came up with the wily solution of erecting the statue in the campo of the Scuola di San Marco. But the cheat ended there. 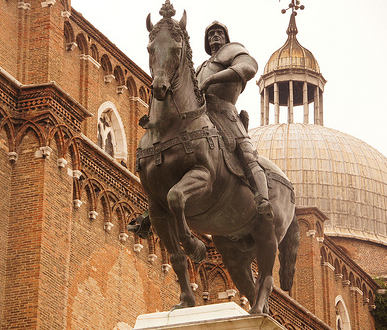 In return for his ducats, Venice gave Colleoni one of the greatest equestrian statues of all time. Andrea Verrocchio, sculptor, alchemist and the master of Leonardo da Vinci and Botticelli, won the competition to make the monument in 1479, and was on the point of casting the horse when he heard a rumour that the Venetians doubted his ability to make the rider and were looking for another artist. Furious, Verrocchio broke the cast and went back to Florence. The Venetians banned him from Venice, and by the time the two parties were reconciled and Verrocchio went back to work, he only had time to make the casts for the horse and rider before his death. The Republic then entrusted Alessandro Leopardi to cast Verrocchio’s figures and the plinth beneath them, and the monument was unveiled, at last, in 1496. Compared to the powerful dynamics of Verrochio’s Colleoni, Donatello’s Gattamelata looks like the pussycat of his nickname; in fact, it’s hard to avoid noting Colleoni’s striking resemblance to Klaus Kinski. And it is fitting, for if Werner Herzog ever wanted to make a film about a Renaissance condottiere, Colleoni would fit the bill.